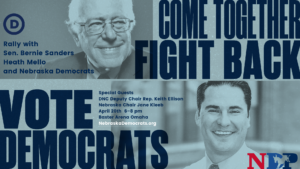 OMAHA, Neb.—The Nebraska Democratic Party and the Democratic National Committee (DNC) will host “Come Together, Fight Back, Vote Democrats,” on April 20 at the Baxter Arena, a rally in support of Democratic candidates in Lincoln and Omaha city elections. The rally will feature remarks from Senator Bernie Sanders, Democratic National Committee Vice Chair Rep. Keith Ellison, Omaha mayoral candidate Heath Mello and State Democratic Party Chair Jane Kleeb. The rally is part of a national tour sponsored by the DNC to connect with local elections and the grassroots base of the party. “Come Together, Fight Back, Vote Democrats” rally will be held on April 20 at the Baxter Arena, 2425 S 67th St in Omaha. The program will run from 5:40-8:00 PM, and doors will open to the public at 4:30 PM. Media interested in covering this event must complete this form with tech specifics needed–the form must be completed by Monday at 5pm CT: http://tinyurl.com/NebDemPress. Musicians to perform include:The Mynabirds; Young Spirit Native Dancers; Mariachi Rey Azteca; and the Cross Bearing Nation. Omaha and Lincoln City Council Candidates; Preston Love, Black Votes Matter; Willie Hamilton, Black Men United; Frank LaMere, Vice Chair, Nebraska Democratic Party and member of the Winnebago Nation; Larry Wright, Chairman of the Ponca Nation; Crystal Rhodes, Chair, Douglas County Democrats; Jane Egan, Chair, Lancaster County Democrats; Sergio Sosa, Latino/a PAC; Fatima Lagunas; Dreamer; Sue Martin, President, Nebraska AFL-CIO; State Senator Mike McDonnell; Steve LeClair, President, IAFF Local 385; Bridget Donovan, President of the Omaha Education Association; and Ron Kaminski, Democratic National Committee member and LiUNA Local #1140. More than 4,000 tickets have already been reserved for this event. Anyone who would like to sign up for a free ticket can receive one in person at the Baxter Arena Box Office (2425 S. 67th Street), Monday through Friday from 10 A.M.-6 P.M. or online at universe.com/nebdem. Our team will email all press who RSVP load in time, parking and other details on Wed.